Windows PowerShell is designed especially for system administration. In this section we will discuss some important PowerShell commands every system administrator must know to make their life easier. One of the most powerful features of Windows PowerShell is that it lets you navigate through many different data stores by using the same familiar techniques that you use to navigate in the Windows file system. Windows PowerShell drives can be created in any data store that is available in Windows PowerShell, and they can have any valid name, such as “D” or “MyDrive“, followed by a colon (:). You can navigate in them by using that same methods that you would use in a file system drive. However, the Windows PowerShell drives are visible only in Windows PowerShell. You cannot see them or gain access to them in File Explorer or Cmd.exe. PS C:\Users\Surender\Documents> New-PSDrive -Name MyDrive -PSProvider FileSystem -Root "D:\MyScripts"
If you are already familiar with other command-line shells such as cmd.exe and Linux command-line, you might be tempted to type the familiar commands such as cd, dir, ls, and cat after opening Windows PowerShell. Well, you can use these commands since Windows PowerShell has built-in aliases created for most popular commands. The cd is an alias for the Set-Location cmdlet, the cmdlet that changes the current location to the specified path. The dir and ls are aliases for the Get-Childitem cmdlet, the cmdlet that lists the contents of a directory. The cat is an alias for Get-Content cmdlet the cmdlet that prints the contents of a file. To navigate within the file system drive, use the Set-Location (cd) and Get-Childitem (dir, ls) cmdlets. In Windows PowerShell, drives are indicated by the drive name followed by a colon (:), such as D:, and parent items are separated from child item by backslashes (\) or forward slashes (/), such as D:\MyScripts. As in other command-line shells, you can change locations, create, delete, move, and copy directories and files, and change their properties. You can even use tab-completion feature for path names and cmdlet names. The built-in variables such as $home for your home directory, and $pshome for Windows PowerShell installation directory comes handy while using PowerShell. Windows PowerShell uses following cmdlets to work with files and folders. For more details on each cmdlet, see the Help for specific cmdlet. The below mentioned commands change the current working directory to D:\MyScripts, then list the contents of current working directory. The New-Item command is used to create a new file with the name TestFile.txt. To create the directory, you need to use New-Item cmdlet with ‘-ItemType Directory‘ parameter. You can navigate through the Windows Registry by using the same techniques that you use to navigate in the file system drive. In Windows PowerShell, the HKEY_LOCAL_MACHINE hive maps to the Windows PowerShell HKLM: drive and the HKEY_CURRENT_USER hive maps to HKCU: drive. Notice that I have used sl (alias for Set-Location) to change the working directory to HKEY_CURRENT_USER registry hive. The gci (alias for Get-ChildItem) to list the contents for current working directory. The entries in a registry key are considered to be properties of the key in which they are located. 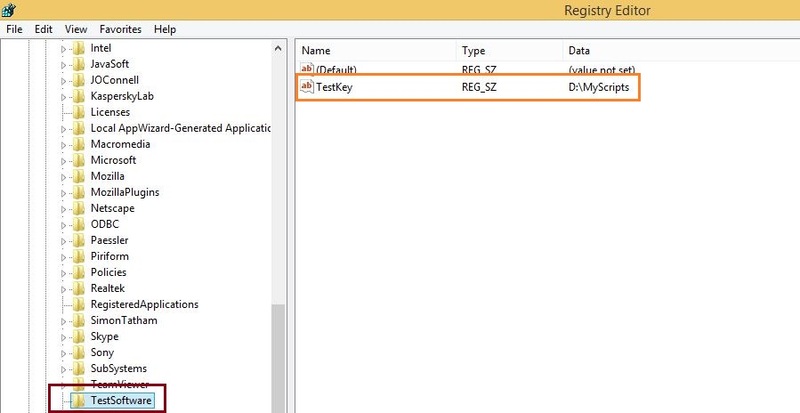 You can use the Get-ItemProperty cmdlet to retrieve the properties of a Registry Key. For example, if you want to see the value of the Windows PowerShell execution policy, you can use the Get-ExecutionPolicy cmdlet or navigate to the ExecutionPolicy registry entry that stores the value in HKLM:\Software\Microsoft\PowerShell\1\ShellIds\Microsoft.PowerShell. The New-Item cmdlet is versatile and particularly good for creating files and folders. If you want to create the actual values or leaf items in the Windows registry, then use the cmdlet New-ItemProperty. Caution: Windows Registry is a critical resource. Therefore registry editing is not recommended if you are a new user. If you want to play with registry items using Windows PowerShell, I would suggest playing around with the values of HKCU: drive, since this will only affect current user profile and not the whole system. Let’s first navigate to HKEY_CURRENT_USER\SOFTWARE subkey and then create a new subkey with the name TestSoftware. Then we will create a new registry item with the name TestKey and then we will set the value of new registry item. PS HKCU:\SOFTWARE> New-ItemProperty -Path .\TestSoftware -Name TestKey -PropertyType String -Value "D:\MyScripts"
After running the above commands, you can verify that the key and values are created in Windows Registry. You can change the registry key values using Set-ItemProperty cmdlet as shown below. PS HKCU:\SOFTWARE> Set-ItemProperty -Path .\TestSoftware -Name TestKey -Value "C:\Users\surender"
To remove the registry item, use Remove-Item cmdlet. Exercise caution while removing any registry item; you may crash your system if you delete any critical key or value. Fortunately Windows PowerShell gives a -WhatIf parameter with every cmdlet which will tell you what would happen if you run this command without actually running the command. Before deleting files or erasing stuff, I advise you to see what happens with Get-Item before you unleash Remove-Item. What if: Performing the operation "Remove Key" on target "Item: HKEY_CURRENT_USER\SOFTWARE\TestSoftware". Get-ChildItem : Cannot find path 'HKEY_CURRENT_USER\SOFTWARE\TestSoftware' because it does not exist. This is how you can work with Windows Registry. The process is pretty much same as working with file system, files and folders. You can navigate the digital certificate store on your computer. The certificate store maps to the Windows PowerShell Cert: drive. The following example shows how to use Set-Location (cd) and Get-Childitem (dir, ls) to navigate the Cert: drive. Windows PowerShell providers are Microsoft .NET Framework-based programs that make the data in a specialized data store available in Windows PowerShell so that you can view and manage it.